Joe Giblin/AP PhotosYou can cut your grocery bill by up to 50%. The grocery store can really eat up a budget – the monthly median spending on food for American families is roughly $US520. But anyone can cut up to 50% off their grocery bill, according to Coupons.com’s Jeanette Pavini. The key to grocery shopping the right way lies in joining your grocery store‘s loyalty program and being strategic to maximise your member’s savings benefits. Grocery shopping is known to eat away at our budgets. The monthly median spending on food for American families is roughly $US520, according to a 2017 survey by Gallup. But your grocery bill doesn’t have to be that high. There’s no reason why you shouldn’t be a member of your local grocery store‘s loyalty program – it’s free and takes about a minute to sign up, says Pavini. “Now, you will be able to get all the reward member deals…and I mean deals!” she said. 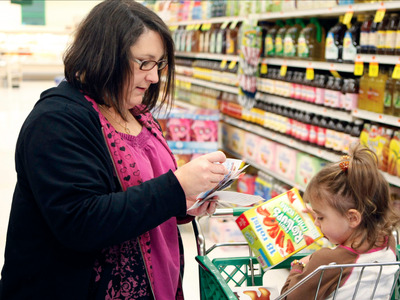 Those deals become even bigger when you use them with coupons.Pavini previously told Business Insider that being a member of a grocery store loyalty program and using coupons is the cheapest option for foods like cereal, especially for an average family. Coupons are the perfect example of getting the most bang for your buck once you’re a member of your grocery store’s loyalty program. To truly maximise the savings you get by being a member, you need to be strategic. Before you head to the store, lay out a plan. Don’t create a weekly grocery shopping list based solely on the holes in your pantry and empty drawers in your fridge. And don’t forget your coupons, which you can also find in weekly newspaper ads or via the Coupons.com app, which adds coupons directly to your loyalty cards in your grocery store’s app. At checkout, both the store sales and coupons will come off your total bill. But your strategy doesn’t end there. You should also compare prices, and don’t forget to look high and low while doing so – you can often find less expensive products of the same type of item if it’s not at eye level, according to Pavini. You can also save a lot of money by avoiding pre-cut produce. You’re ultimately paying for the convenience of pre-cut produce, and, as Pavini puts it, it doesn’t take much time to wash, peel, and cut when you think about the savings. All it takes to maximise your savings in the store is a keen eye and a few good questions.